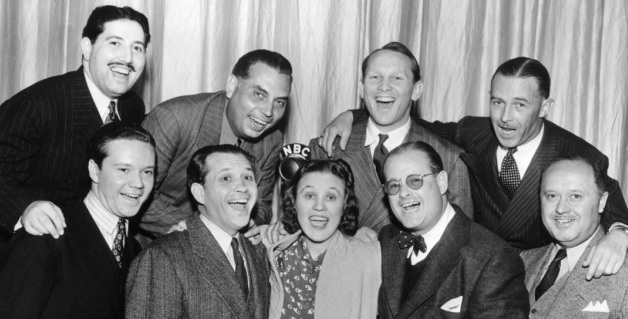 FIBBBER McGEE & MOLLY'S CAST CELEBRATE HER RETURN TO THE SHOW ON APRIL 18, 1939: (top l-r) HAL PEARY, HARLOW WILCOX, DONALD NOVIS, DIRECTOR CECIL UNDERWOOD, (bottom) BILL THOMPSON, JIM & MARIAN JORDAN, DON QUINN & BILLY MILLS. Legendary sitcom Fibber McGee & Molly was known as Fibber McGee & Company for an 18 month period over most of two network seasons when Marian Jordan fell ill and Jim Jordan was forced to carry the show alone. The situation could have doomed the two year old sitcom, but instead it had a surprisingly different outcome. What led to Marian’s absence from the program will always be a matter of debate. Some historians claim it was exhaustion while others blame alcoholism. Now, so many years after her death in 1961 it’s a moot point. But her weakened condition can be easily understood when given the circumstances. By 1937 the 41 year old Jordan and his 39 year old wife had over a decade of radio experience. The couple who had struggled in small town vaudeville broke into radio in 1926 as The O’Henry Twins, (named after the sponsoring candy bar), on WIBO/Chicago and then as Marian & Jim In Songs on the city’s WENR. The Jordans quickly became known in Chicago radio circles for their dialects as well as their song and patter abilities. They each claimed a repertoire of over 70 distinctively different character voices which were put to use on The Air Scouts - where Marian developed her Teeny voice - plus The Farmer Rusk Hour, Jim & Marian‘s Grab Bag and Luke & Mirandy, which led to their playing the characters on NBC‘s National Home & Farm Hour. In 1931 they began their four year run on the weekday Smackout which was picked up from WMAQ/Chicago in succession by CBS, Blue and NBC. That led to concurrent network work on NBC’s Kaltenmeyer’s Kindergarten and Blue’s Breakfast Club where they appeared as Toots & Chickie. Now popular from their radio work, the couple accepted weekend stage appearances in Midwestern towns within driving distance of Chicago, often taking their two young children - Kathryn, then eleven and Jim, Jr., eight - with them. Jim and Marian first met cartoonist turned humor writer Don Quinn in their Farmer Rusk days. Quinn then became a writer for Smackout and proved he knew how to write for the Jordans’ talents, creating dozens of characters and situations for their many voices. Among Smackout’s fans was the Henrietta Johnson Louis, daughter of the head of the Johnson Wax Company. She was also the wife of a partner in Johnson’s ad agency, Needham, Louis and Broby, which was looking to replace Tony Wons' Scrapbook with a new Network Radio property for the wax company. The agency signed the Jordans and Quinn who had formed a three way partnership for $250 a week and story conferences began to determine a name and concept for the new program. The original title the agency chose for the show was Free Air - the story of a vagabond couple of Irish descent touring America by jalopy with the braggart, bumbling husband and his shrewish wife continentally bumping into a salesman for Johnson’s Car Nu auto polish, played by announcer Harlow Wilcox. The first bump in this road - literally - was the title, previously used by Sinclair Lewis in a short story. Lewis wanted $50,000 for the title Free Air, ($857,000 in today’s money), and the title was promptly dropped. Worse yet, first month’s Crossley ratings gave Fibber McGee & Molly a dismal 4.3 average opposite the 27.4 scored by NBC’s top rated Beauty Box Theater. That 4.3 was the poorest rating ever registered by a future Number One show. Nevertheless, the Jordans and Quinn plugged on for 19 weeks in this format, introduced by Wilcox with expressions like , “…your fugitives from formality, your flivving, four-cylinder philosophers…Fibber McGee & Molly!” Jim and Marian would then appear before the studio audience in clownish, ill-fitting “rube” costumes that always opened the show with a laughter and applause. Two major changes took place in July, 1935. First, Fibber McGee & Molly was moved into a better slot on the Blue schedule, Monday nights at 8:00 p.m. with softer competition from Guy Lombardo’s orchestra on CBS and the variety catch-all, Hammerstein’s Music Hall, on NBC. More importantly, a shift in Johnson Wax marketing plans made a lasting impact on the sitcom. Johnson decided to begin advertising its Glo-Coat floor wax on Fibber McGee & Molly which meant that the couple should have a house where announcer Wilcox could come calling to pitch the product. On the broadcast of August 26,1935, the roaming couple stopped in the Quinn-created town of Wistful Vista and Fibber bought a two-dollar raffle ticket, Number 13-13-13, to win a new house. He won the little house at 79 Wistful Vista, promptly fainted and the course for Fibber McGee & Molly was forever changed. The new format allowed Quinn to introduce a number of his Smackout characters - including Marian’s Teeny - to the program. Some of Chicago’s top radio actors became residents of Wistful Vista making visits to the McGee home. Most popular of these callers was Bill Thompson, who was only 23 when he first appeared on the show in January, 1936. Thompson’s Old Timer, Horatio Boomer, Wallace Wimple and many other characters became Fibber McGee & Molly laugh getters for years. Fibber McGee & Molly finished the season in 62nd place with a 6.6 average rating - its last ranking below a season’s Top 25. The sitcom was gathering an audience, Johnson Wax set new sales records and rewarded the Jordan-Quinn team with a new contract and weekly salary of $2,650. The company then promoted the show from the Blue network to NBC for the 1936-37 season in its familiar timeslot of Monday at 8:00 p.m. In what can only be described as one of the stupidest programming moves of Network Radio’s Golden Age, NBC and Johnson Wax moved Fibber McGee & Molly ahead one hour on April, 12, 1937, to 9:00 p.m. in direct competition with the CBS runaway hit, Lux Radio Theater, which had ratings in the 20’s. The simple sitcom from Chicago was no match for the big budgeted Lux productions featuring Hollywood’s biggest names. Fibber McGee & Molly sank back into single digit ratings in May and June - less than half of Lux’s audience - and the pressure was on Jim and Marian to regain their popularity’s momentum. That meant no time off from their radio shows and rehearsals over the summer months when the Jordans filmed their first movie, This Way Please, and fulfilled a number of personal appearance commitments. Their programs against Lux’s summer replacements - nine weeks of Shakespearian plays and symphonic music - pushed Fibber McGee & Molly back into low double digit ratings in September, but by November, Lux once again held a commanding lead of 21.9 to 13.1. The Jordans' broadcast from October, 1937, is also posted below. Listeners will hear a young Perry Como sing with the Weems’ band and notice Molly’s Irish brogue to be thicker than they remember from later years. Marian was tired. Jordan biographers Charles Stumph and Tom Price report in their book Heavenly Days that as early as September, doctors had warned that she was weak and recommended a long rest. Then, after the broadcast of November 8th, her condition became critical and their recommendation became a demand. Marian was ordered off the air and into a sanitarium for an indefinite period to recover her health. The show suffered what seemed to be another loss in January when Ted Weems and his orchestra left the show. Weems was replaced by veteran conductor/arranger Billy Mills who would remain with the program for the next 15 years and eventually create Fibber McGee & Molly’s familiar theme song, Wing To Wing. Jordan and Quinn finally got a break on March 15, 1938, when Johnson Wax and NBC moved Fibber out of Lux Radio Theater’s shadow on Monday night and into its long held 9:30 p.m. timeslot on Tuesdays. The move helped raise the show to Hooperatings that were 20% higher than before the move to Mondays and Marian’s absence. To most everyone’s surprise, Fibber McGee & Company finished the season as a Top 20 show! Marian managed a brief appearance on the show of June 28,1938, but it would be almost a year until she returned permanently. Meanwhile, it was up to her husband and their trusted writer/partner to keep the program going. NBC got smart in the 1938-39 season by making Fibber McGee & Company the centerpiece of its Tuesday night programming, preceding it with a bright new audience participation quiz, Battle of The Sexes with the popular husband and wife team, Frank Crumit & Julia Sanderson. Then, beginning on September 26th, it followed Fibber with The Pepsodent Show starring a brash new comedian from the movies, Bob Hope. With this solid 90-minute block, Fibber McGee & Company rose steadily in the ratings to post a December all-time high, (to that point), of 18.4, beating out Al Jolson on CBS to become Tuesday’s Number One show. After consulting with Marian’s doctors who felt that the Southern California climate would speed her recovery, Jordan and Quinn moved the show to Hollywood on January 31, 1939. Cast regulars Peary, Thompson, Randolph, Wilcox plus Billy Mills’ band, singer Donald Novis and the Four Notes quartet all moved West with them. The move’s only casualty was Silly Watson because Studebaker‘s heavy Chicago soap opera schedule forced him to stay behind and leave the show. The move to Hollywood gave Quinn a whole new batch of skilled actors to work into Fibber’s plots - Jim Backus, Mel Blanc, Verna Felton, Frank Nelson, Elvia Allman, Walter Tetley and veteran comedienne Zazu Pitts who became a semi-regular on the show. A prime show from this period, March 14, 1939, in which Peary is featured as a salesman named Daryrimple for the Gildersleeve Memory Course. (2) Blanc plays a hiccupping bandit, Thompson appears as both Horatio Boomer and The Old Timer and Jordan rattles off one of Fibber’s famous alliteration monologues. Listeners responded in big numbers. The February-March Hooperating average for Fibber McGee & Company was 22.1. Jim and Quinn celebrated their 200th show for Johnson Wax on April 11, 1939, with the regular cast and Pitts. Then, in Jordan‘s sign-off remarks, he said that the following week‘s 201st show would be something special - the program would once again become Fibber McGee & Molly. Molly’s April 18th homecoming show seemed like old times with Marian sitting at a table-top mike and the rest of the cast standing at center stage. She only referred to her absence once but Harlow Wilcox’s introduction of "Fibber McGee AND Molly!" followed by long applause told the story. The audience was glad to have her back and the ratings showed it. The sitcom finished in the Top Five for the season, then Number Three in 1939-40 - beating out its old nemesis, Lux Radio Theater, 24.8 to 23.7. Not bad for a show that given a suicide timeslot and lost its co-star just five years earlier. But like every episode of Fibber McGee & Molly, it had a happy ending. (1) For 16 weeks of 1935 - April 16th until August 3rd - the Jordans appeared on both Smackout and Fibber McGee & Molly. (2) Hal Peary’s character Throckmorton P. Gildersleeve wasn’t introduced on the program until October 17,1939. Don Quinn obviously liked the name. Throckmorton was the name of the street where Peary lived.